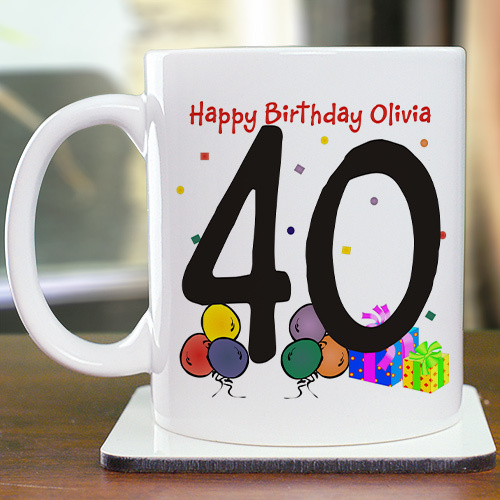 Celebrate your Dad's, Mom's, Aunt's or Uncle's 40th birthday with a fun & unique 40th Birthday Customizable Coffee Mugs. These Personalized mugs are sure to be a hit & used long after their 40th birthday party has ended. Our Custom Printed Happy Birthday Ceramic Coffee Mug is Dishwasher safe and holds 11 oz. Includes FREE Personalization! Personalize your Happy Birthday Coffee Mug with any name & age. Comes exactly as pictured with individual personalization. . Great birthday gift.